Once seen as nearly impervious to viruses and security threats, viruses are becoming a much more serious problem for Mac users. Although the scope of infection across the board is still relatively small in comparison to the number of Mac computers, it is still essential for Mac users to keep security threats on their radar. By staying aware of what threats could potentially impact your machine, you will better equipped to deal with any issues when they crop up on your machine. Of course, quick response times will help minimize the risk of damage to the computer. Perhaps the biggest concern on Mac users’ radars at the moment is the Flashback virus. This is a virus that could potentially damaging to those running an online marketing campaign, particularly because the virus attacks users through a weak spot in Java programming. Because most online marketers will be running some form of Java on their machines, they are ripe for possible infection by the Flashback virus. In order to make certain that the Flashback virus and other threats are not able to attack your machine through your Java installation, you will want to be certain to install all available updates before browsing on the Internet. Marketing professionals could also be at particular risk of malware that purports to find viral threats in operation on a machine. Because most of the major Internet security firms do not produce software package for Macintosh machines, it can be difficult to find products that come from reputable antivirus companies. As trojans like the Flashback become more prevalent, many users are flocking to the Internet in search of tools that can help keep them protected from viruses that target users on the Mac operating system. Many of the programs available to help identify whether viruses are found on the machine are actually malware packages, much like those often seen on Windows machines. The programs in turn tell the user that there are in fact many viruses in operation on the machine, when there are actually none to be found. In order to remove these invisible viruses, the machine user is made to pay for an upgraded version of the software that can remove the supposed threats from the machine. Once the money had been paid, the threats disappear magically. Not only is the user out the money they have spent, but they could also be subjected to identity theft in this manner. efficient for hackers to develop products that target Windows machines, as they have a greater chance of being effective at infecting a large number of machines. As Mac usage becomes more prolific, viruses have a greater chance of cropping up, simply because hackers have realized that there is a large pool of people waiting to be infected on Mac computer. The Flashback virus alone is estimated to have infected some 600,000 users, with more than half of those users in the United States. antivirus malware requires using a certain amount of common sense. In the long run, it can be hard to avoid all Mac viruses, but users should address any concerns they have as soon as they crop up. Apple can be contacted directly in case of a suspected virus infection. I hope that they will solve this issue right away. I know that there are many users out there that are affected. I’ve recently seen an increase of articles and blog posts talking about Macs and viruses they can attain. I had purchased a Mac recently for the main reason that I would not have to worry about viruses (I have lost a couple of PCs to viruses) but a Mac’s seemingly growing vulnerability to viruses is a bit worrisome. I also wonder if this will lower their cost (that could be the only bright side to this ordeal!). 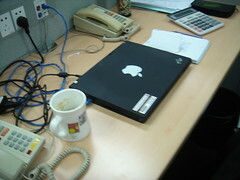 Mac books are there in the market and lots of businessmens prefer to buy it due to low virus infection one can have on these systems.But Hearing that Macbooks are also having some problems regarding malwares and viruses will make the buyers think twice.hope this problem will soon be demolished.